Divide your layers into separate blocks via block size or via label colour. Hovering over the UI will highlight what labels are selected. Offset layers individually, or control inside and outside the blocks. Staircase comes with some great additional features like staggering based on position, adding easing to each block and fading between blocks. Stagger different blocks of layers in multiple increments and in the order they're selected. 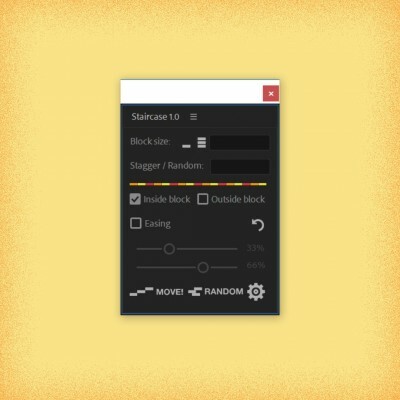 Alt + Click staggers layers and blocks based on their position within the composition. - Base position on the center point of each block and layer, or it’s bounding box. - Stagger inside blocks and outside blocks based on position seperately. to the direction chosen. E.g. If direction chosen is down: Layers and blocks will be sorted based on their top edge. Add additional easing elements to the main UI. Ease all selected layers, or choose to ease inside or outside blocks. Sequence layers individually or in blocks. Staircase works out the overall in-point and out-point of each block and adjusts accordingly. Shift + Click to fade in. Alt + Click to fade out. Shift + Alt + Click to fade in and out. Randomise blocks of layers up to a defined amount forwards in time. Shift + Click to randomise blocks of layers up to a defined amount forwards and backwards in time. Add additional elements you see in the main UI to what ever best suits your needs. Just re open the script to see the changes. - Choose a unit value between: Frames, Seconds Minutes. - Round to the nearest frame when easing. - Merge label colours into single blocks if they're not together in the timeline. - Move layers to the CTI. 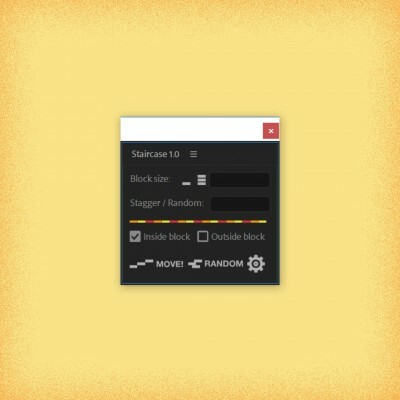 - Create a block from all layers selected. Staircase works with After Effects CC 2014.2 and up. 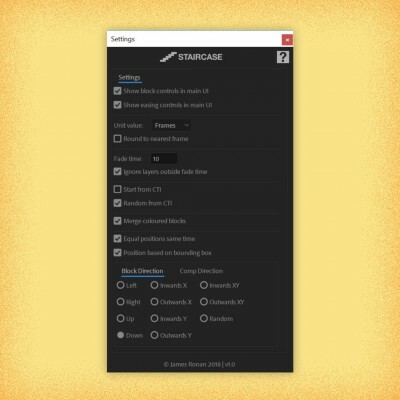 Staircase has support for multiple languages in AE. But please test script in Trial mode before purchasing. Staircase is limited to 6 layers and 7 days in the trial. Bug fix - When "Inside Block" is checked, layers will now stagger from it's corrosponding blocks start time. Added support for AE additional languages.